It's my third time to join the WORLD NUTELLA DAY and I have never been more ecstatic. Though I have to make a quick visit to the nearby grocery store to buy a jar of chocolate hazelnut goodness, which spells Nutella, it didn't mind and nothing hampered me to participate in this year's global event for Nutella lovers. Today, February 5, 2014, bloggers all over the globe are making waves, as recipes upon recipes, photos of Nutella and how it's indulged, are being shared and compiled at World Nutella Day website. The event is being led by Sara from Ms. Adventures in Italy and Michelle from Bleeding Espresso, now already running on it's 8th year despite some issues met months back. My share to the exciting and yummy event - the recipe Nutella Bacon Brownies. Are those brownies calling your name or what? 1. Whisk in the sugar with the butter until combined. 2. Add the eggs, one at a time, mixing well after each addition. Stir in vanilla. 3. Slowly add the Nutella. 3. Dump in the dry ingredients and mix until combined, add bacon then pour the batter into the prepared pan. 4. Bake for 35-40 minutes at 350 C or until a toothpick inserted in the middle comes out with a few crumbs clinging to it. Allow brownies to cool for at least 45 minutes. I mean how can you go wrong with Nutella and it's new sweetheart, Bacon, 'nuf said! 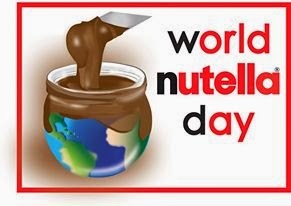 To find out more about the massive Nutella-lovers' movement, check out their FACEBOOK page at World Nutella Day. Why not join the fun! Click HERE to know how.